With his latest novel Alastair Reynolds has, not for the first time, produced a curate's egg. However, since this is his seventh novel and he is now deep into his career this particular egg must surely mark the point where we have to finally accept that he is probably never going to write the great novel that a lot of people (myself included) thought he had in him. The omens for this book were always mixed: although it was a return to the setting and style of his best novel, Chasm City (2001), it followed on the heels of his worst, Pushing Ice (2005). His recent short fiction—the form that Reynolds has always excelled in—has also been disappointingly pedestrian. Even in these minor works though, there was always enough of a spark to keep hope alive within his readers. For me, at least, The Prefect was a make-or-break book and although it initially seemed it would repay my hope, in the end it extinguished it. It is set in the same brilliantly conceived universe as his first four novels ( Revelation Space , 2000; Chasm City ; Redemption Ark , 2002; and Absolution Gap , 2003), a setting which also united his recent Galactic North short story collection. The Prefect takes place prior to the other novels, at a time before plague has devastated the same system we see in Chasm City . Instead the planet of Yellowstone, with its Glitter Band of ten thousand orbital habitats, represents the epitome of baseline human civilisation. Tom Dreyfus is the titular Prefect, a law enforcement agent of the Panoply. Existing outside of the myriad independent societies of the Band they uphold a single law: that every citizen of the system must be enfranchised. Each individual habitat can function as a state with its own laws and political philosophy, but the Panoply is there to ensure everyone remains a citizen of the Glitter Band as well. With his deputies Ng and Sparver, Dreyfus is repairing a glitch in the voting software, but is pulled off this case to investigate the destruction of a habitat and the deaths of all inside. This is an unprecedented catastrophe for the Band, and may even represent an act of war. From there the investigation expands outwards with a speed and invention that is a pleasure to read, eventually encompassing secret cabals, Panoply corruption, strongly superhuman AIs, and potential genocide. There was a time whilst reading The Prefect that I thought it might turn out to be my favourite of Reynolds's books. He is a writer who has a casual, instinctive grasp of the future. In contrast to the technogothic atmosphere of the post-plague novels, here he presents (at least initially) a more traditional, optimistic future predicated on nanotechnology while at the same time reinvigorating some staler tropes. "The door irised open" is considered a sort of benchmark of show-don't-tell world-building, and examples of this sort of pithy matter-of-factness abound showing both Reynolds's immersion in his world and his respect for his readers. His conception of a nanotechnology airlock might be radically different from the mechanical variety we are familiar with but it is introduced as casually as Heinlein's irising door. However, whilst his world-building skills are never in doubt he has a severe credibility gap when it comes to naturalism: his wonderful grasp of the possibilities of future technology and society are not matched by his understanding of individual human nature. Depressingly, you can always see the outline of a better book inside Reynolds and The Prefect is particularly frustrating because there are no huge mistakes, nothing you can point at and say "this broke the book;" instead it is eventually overwhelmed by an aggregate of small problems. What starts off as a dazzlingly compulsive thriller is slowly ground down by lazy, thoughtless writing. At one point, for example, Ng gives a little pep talk: "Okay, people, let's stick together. Like the man said, there could be some angry citizens out there, and we may be the ones they decide to take it out on." This might be acceptable on Hill Street Blues but not in a book set in the 25th century. This sort of clunky dialogue—the ghost memory of a thousand police procedurals—litters the novel. Something similar is true of the characterisation. As you would hope, Dreyfus is the most fully developed character, but even he is not particularly well-realised and is too often reduced to a maverick cop archetype. Supporting characters fare even worse. The council of Senior Prefects who govern the Panoply are depicted as venal, petty fools. They form the opposite pole of cliché to Dreyfus: the out-of-touch brass who are too concerned with their own political self-interest to pay attention to their man on the ground. This caricature is taken to ludicrous levels and the repeated choice—conscious or otherwise—of plot expediency over realism undermines the novel. Given this it was perhaps an unwise structural choice to start the novel from Ng's weaker viewpoint and then to alternate chapters between her and Dreyfus. Not only is her character less rounded but her story is less interesting. I have said little about the details of the plot, but Dreyfus's chapters are crammed to bursting with developments that are more than enough to sustain the novel, and to be dragged away from these to focus on the minor issues unbalances the novel and irritates the reader. That Reynolds himself seems to come to the same realisation and abandons Ng's viewpoint about half way through the novel to concentrate exclusively on Dreyfus only makes things worse. Novels don't need to have perfect symmetry but at the same time they shouldn't be three-legged mongrels. This is a recurring theme for Reynolds, and it is notable that the most structurally sound of his novels is Chasm City which deliberately lifts the outline from Iain M. Banks's Use Of Weapons . And then, part and parcel of the same problem, we have the ending. Like Neal Stephenson, Reynolds has become notorious for his inability to provide a satisfying conclusion to his novels, a valid complaint right from his debut novel. With a book like Pushing Ice this is because his languid build-up (hundreds and hundreds of pages with very little happening) means he must charge through the ending tying up loose ends before he runs out of space. With The Prefect the opposite is true: the scope and scale of the issues introduced up front leave the simple conclusion feeling anticlimatic. In both cases you get the sense that Reynolds isn't sure what his priorities are, and this is accompanied by a more general impression that he is not in control of his novels. He is one of Gollancz's most popular novelists, so much so that in 2004 he quit his day job at the European Space Agency to write full time. That would have been the perfect opportunity to take control, to take his craft to the next level by getting to grips with some of the fundamental aspects of novel-length writing that do not come naturally to him; but it didn't happen and it seems doubtful it ever will. Martin Lewis lives in East London. His reviews have appeared in venues including Vector , SF Site , and The New York Review of SF . Everyone is entitled to their own opinion. Mine? I loved this book and recommend it highly. I would argue to people that they should not judge a book by another persons review - I am loving this book so far. But as a reader of Reynolds other books I am forced to agree with you're critisisms. Characters sometimes seem flat, and endings never seem to stand up against the great plots and almost cinematic events. But I don't think this spoils his work or any others. It's not the best, but its good, and its exciting. "medioker-at-best & generic sci-fi novel?" I hardly think so. It's a fantastic novel, but the reviewer has a good point with the ending. It feels rushed, and not quite up to the standard of the rest of the novel. Still one of the better SF novels I've read in the past couple of years. A very enjoyable book! Have read most of his books and liked them. This time after reading I thought "is it me or was that not so good?" Not trusting myself I sought out more opinions on the web. Seems like your review is the only one who agrees with me but i'm more convinced than ever. Midway report, I am on page 307 now. Reviewer is right on the language. It is cheap. And somehow this feels also oversaturated with all kind of fancy stuff. Definitely not the best of Reynolds. Interesting review, but I thought Pushing Ice was an absolute masterpiece, and the kind of novel that most authors don't right anymore. I agree with some of the criticism but find it a bit harsh. 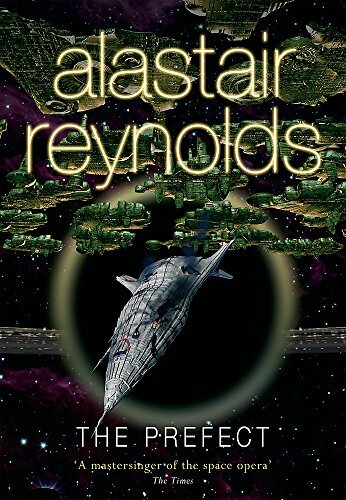 I've really enjoyed all Reynolds "Revelation Space Universe" novels and think this is one of the best. Well-paced and all storylines come together nicely in the end. The variety of worlds that were on offer perhaps indicate the direction of democracy. The ability of the indiviudal to choose their personal direction. I particualrly liked the world where people chose to be under authoritarian rule, to be governed and micro managed to the nth degree. Strangehorizons is the place to go to read reviewers who just hate everything they read. Google a book, and there is a good chance it is a traget of hate and derision by Strangehorizons. 'Traget of Hate' is the name of my next band. “[Author] has written a book. This is to be commended in itself, as books are often very long and contain a great many words. Many more books are written than are published. Certainly I have never written a book that was published and neither, I suspect, have you. So hooray for [Author]! The book is about [insert short, hopefully engaging summary of the story here. The critic may adapt this from the blurb or press release if they are pushed for time or sleepy]. That this story is communicated at all is, again, to be commended. All of the sentences are in some way about things that happened in the story and successfully communicate those things. I am sure that many people will enjoy this book – particularly if they enjoy the kind of stories that it tells, which can be found in [other books]. Other people may not enjoy some things about this book, or even not enjoy it at all, but that is very much their problem. Each to their own, I say.